Our Saturday workshops are a way for the whole family to learn how to give old objects a new lease of life, while promoting responsible consumption and sustainable development through a host of activities! 11 am-2 pm. WORKSHOP 1: BICIA’T Bicycle repair. Prior registration necessary. Places are limited, and reservations will be made in order of registration. - Workshops are free of charge for accompanying adults. Children, teenagers and adults who would like to learn how to give new life to unused objects, and to work collectively, exchanging knowledge, experience and materials. To discover playful, creative and educational alternatives during this period when we find ourselves overwhelmed by a consumption-orientated environment. WORKSHOP 1: BICIA’T - Saturday 22 at 11am. The recycled bike workshop consists of a meeting place where you can learn a lot about practical bicycle mechanics, along with experts who offer advice on how to make a disused bike ready to ride, or how to fix everyday breakages. The workshop will give participants a grounding in basic bicycle mechanics, and will also suggest new uses for irreparable bicycles. We use old bikes for all kinds of spare parts and materials, to promote the values ​​of recycling, reuse and creative uses of disused materials. Materials to bring: An old bicycle to be repaired. Irreparable old bikes, to be changed in form and function. WORKSHOP 2: FES-TE EL TEU JOC! - Make your own game. Saturday 22 at 5pm. This is a workshop for making games with recovered materials and everyday objects, offering a space with tools, resources and technical support to build games. To familiarise participants with the possibilities, there will be a demonstration of a dozen models based on existing or new ideas for a game. Games are open to free interpretation and creation, according to the participants' taste. The idea is to include the characteristics of recovered objects (waste material) within the game. A challenge to the ability of players, and an alternative or complement to commercially available toys purchased from shops. Materials to bring: Objects or unused materials from home (cartons, tops and caps, old objects, tubes, containers etc.). 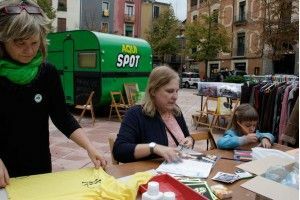 WORKSHOP 3: TALLER DE TITELLES I CONTES AMB MATERIAL RECICLAT - Saturday 29 at 11am. Intringulis offers a fun workshop combining puppet-making and theatrical performance, divided into two parts. During the first part, puppets will be made ​​from recycled materials. EXTRAVAGANT characters such as ...The Queen of Green, Tonet Mc Recycled Button, Princess Belle... the bodies made out of water bottles, gloves, hair dryers... and the eyes, mouths and noses, made of buttons, nails, stickers or any other materials that children can imagine, with a little help from the adults. In the second part, these heroes are brought to life with eccentric characterisations, recycling and reinventing fables and stories around themes such as garden allotments, recycling and respect for the environment. TALLER 4: ARMARI COL·LECTIU - Saturday 29 at 5pm. A nomadic wardrobe to be filled by new or used clothing, in a good condition for making an exchange. Clothes will be exchanged for tickets. For each garment a ticket will be given which may be exchanged for an item which other ticket holders have left on deposit. Leave a pair of trousers and take a sweater, two shirts for a pair of trousers, three pairs of trousers for a coat ... The value of the garments in exchange may be varied according to participants' discretion and common sense. The most important thing is that you exchange. The liability of the value of the exchange, finally, must be assumed by each user. Simultaneously two workshops will be offered, on the creative use of recycled textiles. Must you use so many plastic bags? Make your own bag! In this workshop, participants will create tote-bags using the remaining clothes from the wardrobe after exchanges have been made. Make totebags for shopping, for the beach, storing clothes ... There are currently three different kinds of bags. The workshop provides tools and drawing techniques to print text and graphics on a textile medium. The idea of the workshop is primarily to encourage critical opinion regarding irresponsible consumption. Drawings and letters printed on bags, shirts, blouses, coats, trousers... passing all around the city. Make the others green with envy… make graffiti green. Materials to bring: Clothing and shirts in good condition, to be recycled as handbags. 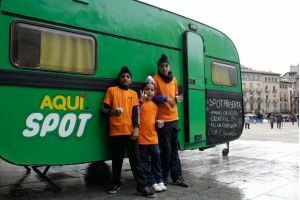 The organisation AQUÍ SPOT (Aquí es pot oferir el Servei Públic d’Optimització de Trastos) is a group comprising individuals and organisations working in fields such as the environment, art, art education, leisure, job placement, and the promotion of cooperatives, and which offer a meeting space in the workshop format to exchange information, experience, ideas, methodologies; a space of creation and debate on environmental policies, rational consumption and reuse; a place to consider alternative thinking and new ways of doing things.